Trained Dispatchers | National 50 Security Services - security, guard, unarmed security, armed security, unarmed, armed, patrol, patrol guard, patrol car, security post, post guard, protection, prevention, executive protection, bodyguard, off duty officer, watch man, female security, investigations, investigative, event security, crowd control, parking officer, parking control, monitoring, dispatchers, foot patrol, cart patrol, national security, security company, los angeles security, private investigations, investigator, security operators, lobby security, uniformed security, uniformed guard, identifiable security, security officer, physical security, plain clothes, wedding security, quincianera security, private security party. National 50 Security and Investigations Inc. Provides dedicated and trained professional security personal in all areas under the above heading. 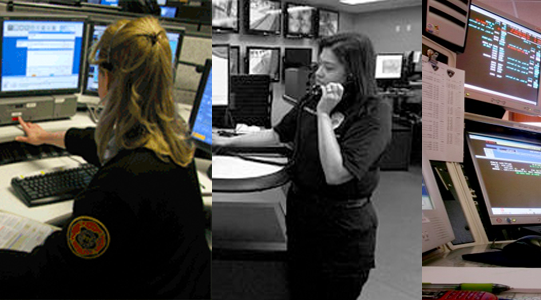 Our personal are experienced officers that can operate, control, monitor and perform functions from simple monitoring and responding to complete command and control centers, which can dispatch, monitor, record and store data and control a total security compliment from a single central location. Officers are training in a variety of monitoring and recording equipment, as well as communications and its equipment, devices and procedures. Officers are trained and schooled in crises situations, as well as programs such as emergencies; i.e. : fire and, or earthquake evacuations. Procedures and protocol range from local security command and control, to notifications and assistance to police, fire, medical and first responders.